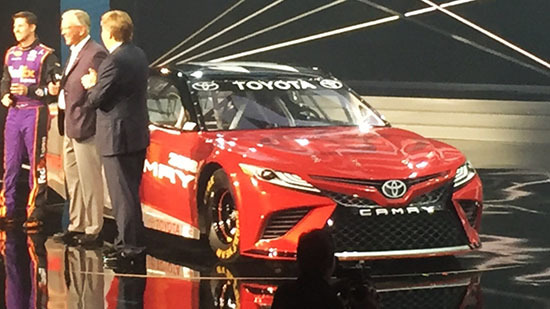 Toyota has revealed their new version of the Camry for Nascar. based" on the next model. Currently, the "Nascar Camry" front end design is very, very similar to the production model. So what we see here could be a very accurate preview of the next Camry front end design. Which is... Very ... Weird? I am not sure such an aggressive look fits the Camry. Sure, things have to be a bit more modern and "sporty" I guess. But Toyota seems to have no clue about coming out with a modern design without being overly aggressive/weird/vulgar. And now the poor old Camry is the new victim of the sad trend. We'll know early next year. The Camry.....current/today's Camry. Is rife with disappointment and is a dud compared to the Camry of days gone by. It's a volume taxi cab. It's boring /non descript and no where near its competitors. I don't know, this doesn't look bad to me! Toyota uses the SE/XSE design for the race cars, so it is safe to say the next SE/XSE models will look like this, not the regular Camrys. Honestly, would we excepct anything else? It's like a strange melding of the 2010, 2012, and 2015 models. They finally got rid of the Prius nose for 2015, only to bring it back. Toyota is the master of taking a milquetoast design and capping each end with aggressive warped plastic. I haven't seen such vulgar design cheapness since Pontiac in the late 80s. standard safety sense tech. Also new rebadged Scions iA and iM now Yaris iA and iM. comment what you think. Hey Vince, how about some photos of the next accord and CRV? Anonymous @ 7:50 AM.. maybe because they don't yet exist?